What have we learnt? We like it! Well it has been a while folks (for those that accidentally come across this site). We were meant to be going to Cumbria without Hilma (taking our Sporting Trials Car instead for a BTRDA trial) but Hilma needed an MOT on Friday and I had an AGM meeting of the fly fishing club so it was really silly thing to try and do (especially as we had reports of another silly weather front from Putin’s way coming in again). So what did we decide to do – yes that’s right, take Hilma out for a night out (she deserves it you know – stuck in her compound with all those other vans with not a human to talk too). 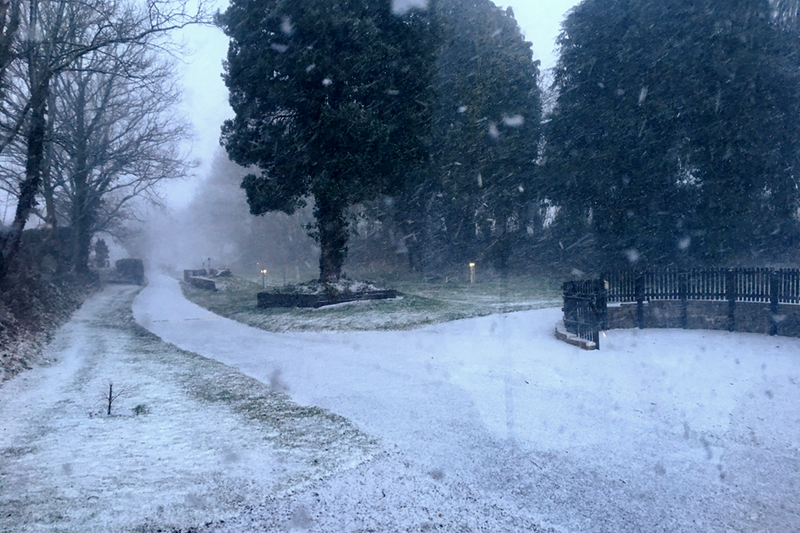 Where did we decide to go – right into the amber weather warning area given by the met office on Friday night. Were we bovvered – of course we were. Off we set Saturday morning and duly arrived at Aberbran (small CC site for 24 vans) on the sight of an old railway station. Charming. Quick cup of tea and off we toddled for a quick circular walk around the valley. 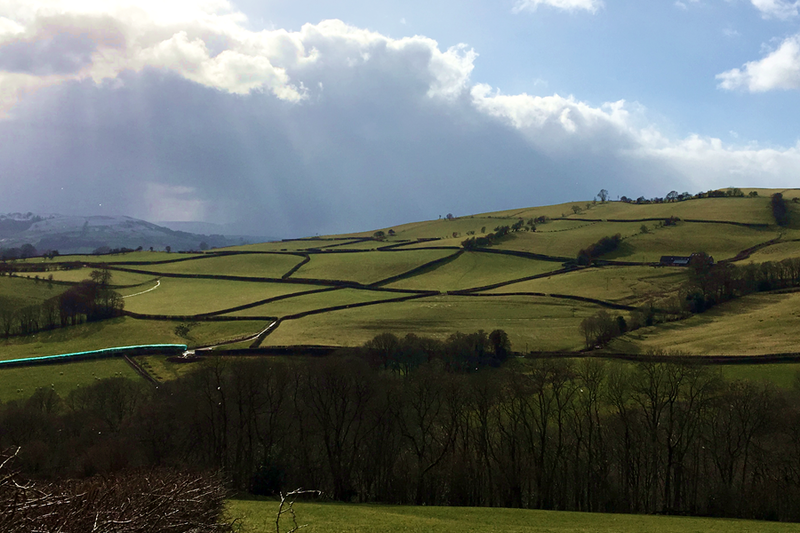 Six nations on the radio was beckoning so I set a stern pace, soon to be slowed as we kept stopping at most farm gates to lean on and take in the views. Yet another view from a farm gate! The views over Pen-y-Fan and Corn Du were absolutely stunning and the photographs taken with my phone do not do them justice – should have brought the camera out. 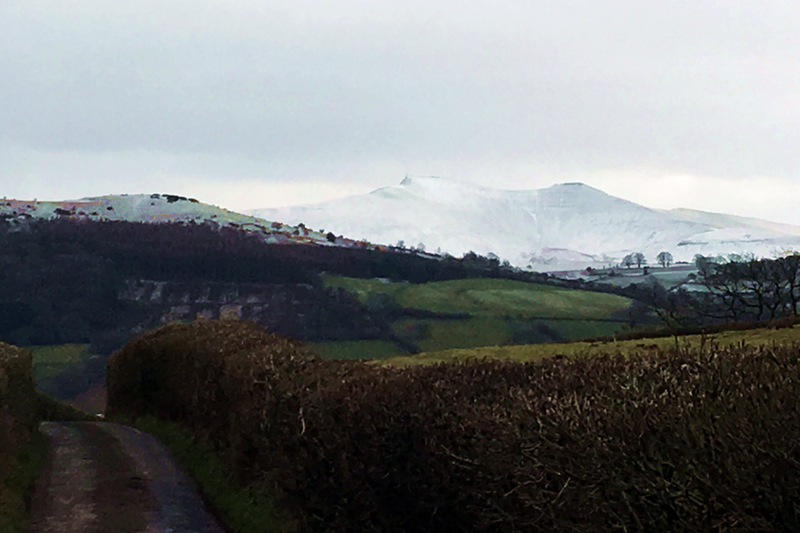 The snow capped tops of Corn Du and Pen-y-Fan. Binoculars showed plenty of people up there braving the elements. The walk was lovely – only spoilt by the England v Ireland score on return to Hilma. A cup of coffee and a whisky mac soon cheered me up (easy to please) and then looking out of the window we saw the Best from the East (part II) starting to show us what we had in store – silly us! 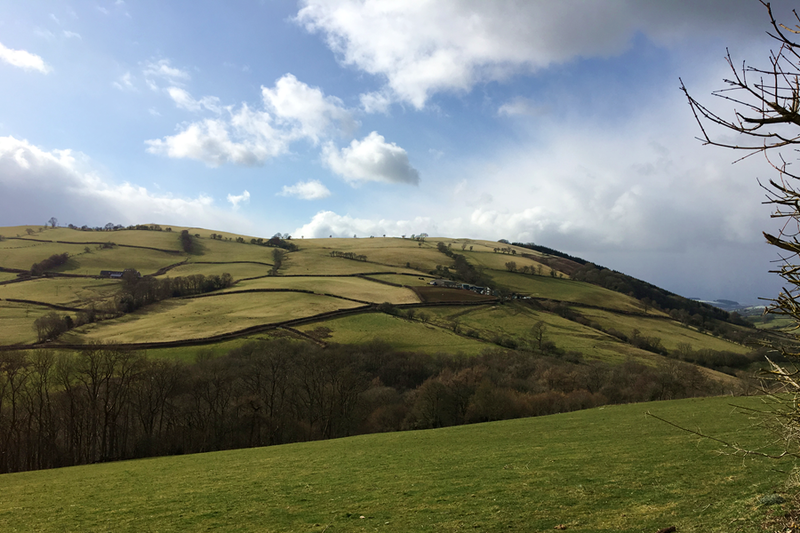 This entry was posted in Our 2nd year, Travels in Hilma and tagged Aberbran, Corn Du, Pen-y-Fan, Snow, The Beast from the East, Wales on March 18, 2018 by studio1901. 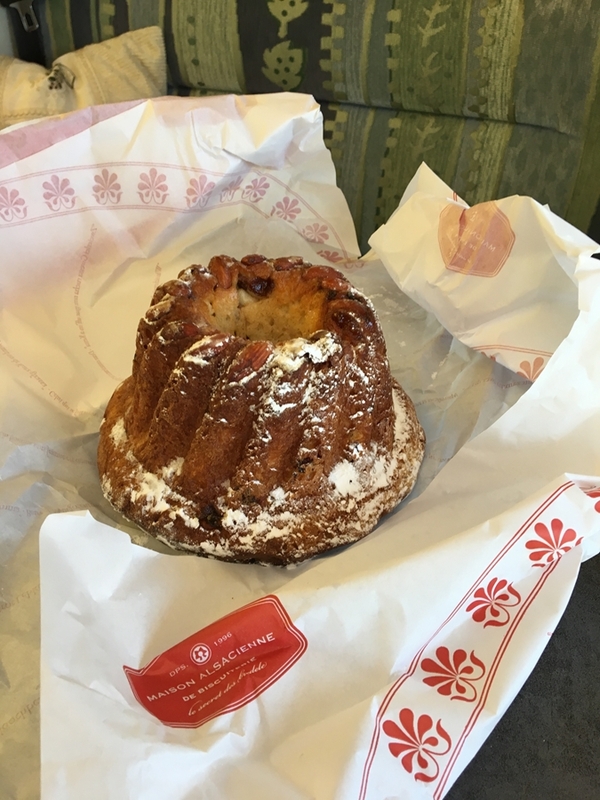 The last of our Kugelhopf was consumed at exactly 13:55hrs today. What the heck am I going to enjoy now? 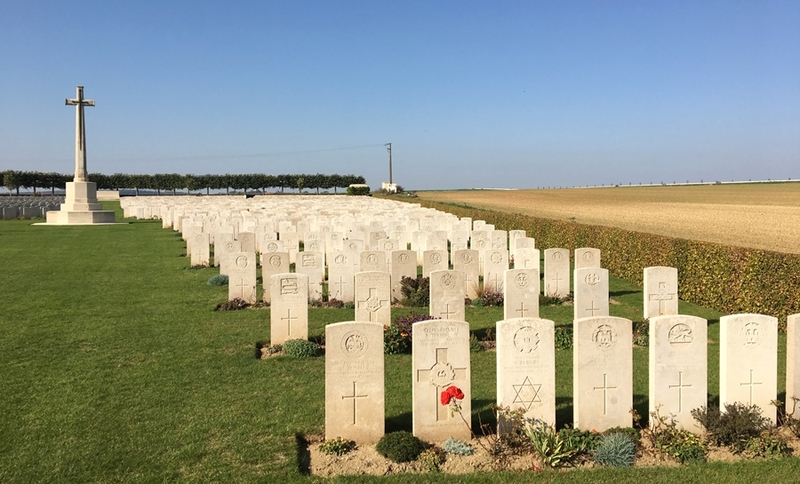 On a more sobering thought we stopped en-route today just outside Arras where there was a British Cemetery dedicated to the fallen in the First World War. Many, many people have visited these special sites over the years, many, many tourist, motor-homers and residents cannot help but be moved by these beautifully manicured spaces of remembrance. 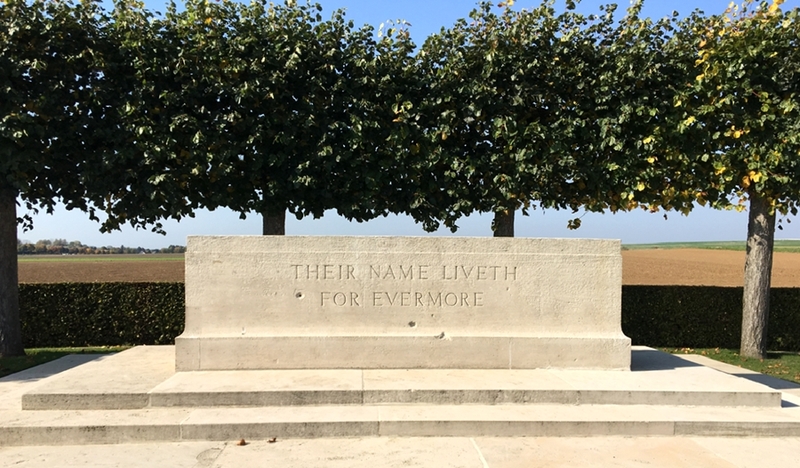 Although sad, they are a fitting reminder of our past and worthy of an occasional visit to show our respect, also to remind us about the horrors of war. 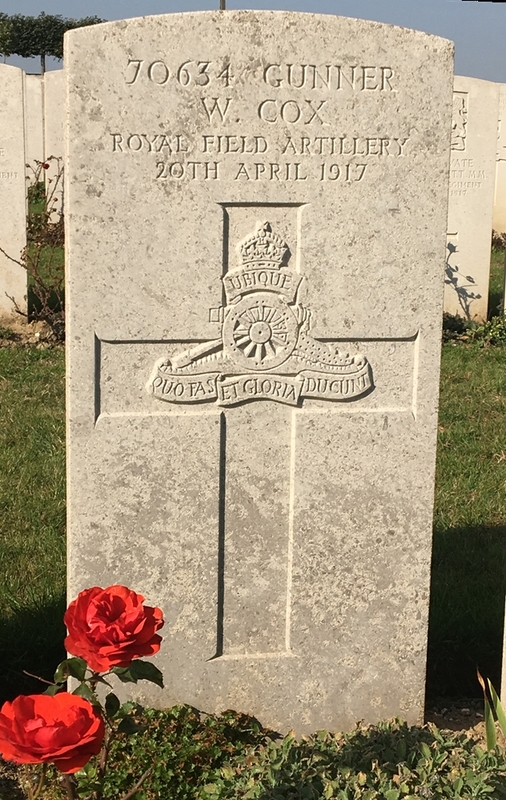 So many, so young, so sad – I do not know of anyone in our family who fought in either the first or second world war, yet I shed a tear for these brave young men, not only British, there were boys and men from all over the commonwealth and respectfully German graves as well. More than 3000 people are buried here, this a tiny plot given by the locals as a token of their respect for helping to liberate their country. I do not know this person or their family – I just thought it fitting to remember him. Maybe at some future date I’ll look into his history. I hope this is not an intrusion for the family. Onward to Embrey – today was a 150 mile drive, I’m beginning to think this is about my limit when driving in France. Janette did offer to drive for which I am very grateful, I just prefer driving than being a passenger. Embrey is a wonderful little aire, about 50 miles from Calais. We came across the first British motor-homers, David & Joyce who were on their way home after a 10 week European trip which included Croatia. Seasoned travellers. 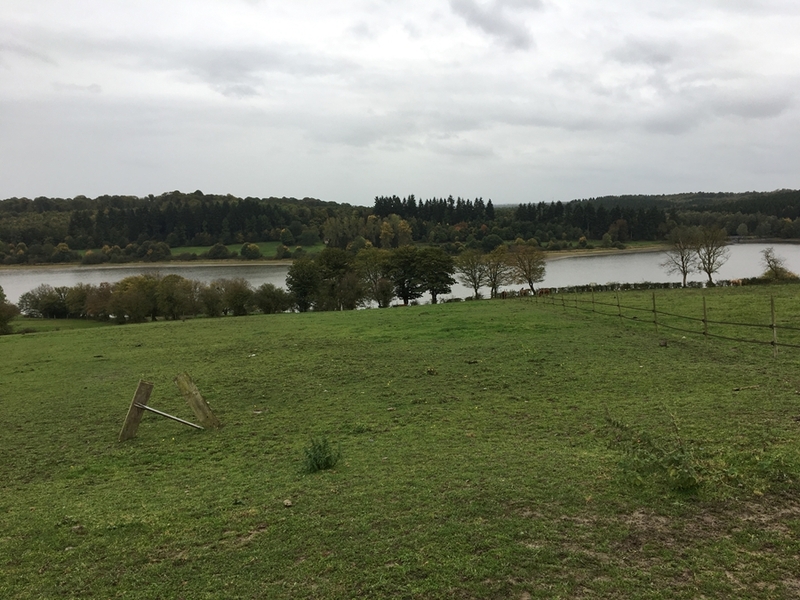 When we left Rocroi we tried to fill up with water from the Urba Flux point – what a nonsense, two euro’s stolen from the card and still no water came out. This was the first time we had attempted to use the service point at an aire, before we came away I was worried about these things – this did not fill us with confidence, however, we had plenty of bottled water, so was not really a problem. When we arrived at Embrey there was a ‘Fot Bleu’ machine so we gave this a go – much easier, a machine to dispense ‘Jetons’ bought with our euro loaded card, pop the jeton into the machine and hey – ho, easy peasy, we had some water. Because we were only about 50 miles away and our ferry was at 14:00hrs we took a slow drive along the coast from Bologne to Calais. Neither of us had driven this before and it was an absolute joy. Such a change to hammering down the ‘peage’ worrying about getting to the ferry on time. A beautiful day – gave Hilma a last drink of French Gazole, we then topped up our tummy’s with some pain-au-raisin as we stopped overlooking La Manche in glorious sunshine. We had never stayed in this region before and were very surprised by the diversity – just inland rolling hills and valleys whilst within a few miles dunes and beaches, definitely worth a couple of days stopover in the future. There I go, planning what to do next. Well I think at the end of a holiday that is a normal thing to do. We are already thinking about Ireland, Brittany and the Camargue – how are we going to fit it all in? This entry was posted in France- our first trip, Our 2nd year, Travels in Hilma and tagged Alsace, Arras, Ferry, First World War, France, Hilma, Motorhoming on October 16, 2017 by studio1901. 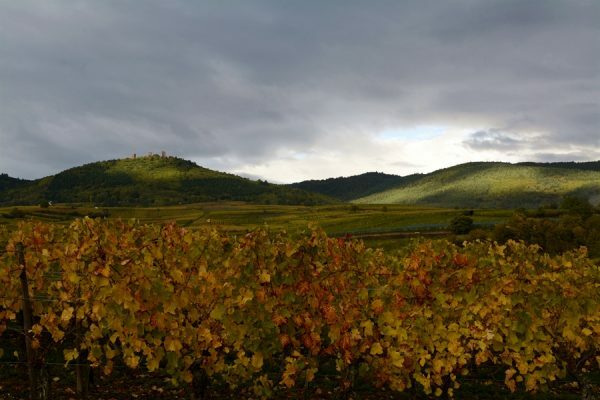 So we leave the beautiful autumn golden vines of the Alsace to turn our noses North for our homeward journey. We are not in a hurry though, we are going to take 4 days to get back to the ferry and enjoy the slow drive back. Climbing out of the Rhine valley was gorgeous, this time of year brings a charm all of its own, the countryside bathed in a low light with the trees glowing, each one on their own autumnal journey. At the top of the climb (a few km’s of 6% but very manageable) we stopped for a coffee and Kugelhopf in a layby. The Kugelhopf in all it’s uneaten glory! Today we are off to an Aire at Millery (Lat: 48.8159N / Long: 6.12701E) situated just above Nancy and on the banks of the R.Moselle. Upon arrival there were 4 vans well spaced apart, by the time darkness fell there were 14! A bit of a squeeze. We had a little wander around Millery finding the old outdoor Lavarie that had been lovingly restored along with the church. There was some signs that the older residents were not in favour of such ‘rapid’ change with a huge sign on someone’s garage asking to sign a petition against the tide of change. The Friday night youths were out on their busy little hairdriers but by 10:00pm all had quietened down. An early mist greeted us coming off the Moselle which made the aire very atmospheric, someone had already left at 6:00am, someone else had launched a boat both of which woke me early. Cup of tea in bed then! We did get off to an early start making sure our fog lights were working – but there was a snag. Although our pull-out bike rack has lights fitted it did not have a fog light, that was fitted on the main light cluster and was hidden by the bike cover. I didn’t feel comfortable traveling without the fog light on display (I’m sure the Gendarme wouldn’t approve) so off came the bike cover and the glorious fog light could now shine through the spokes giving the French tailgaters an ample view of Hilma’s bottom (note: not Hilma’s ample bottom). A coffee break half way (with more Kugelhopf of course – Janette is going to get the recipe) and we decided to motor on all the way to Rocroi, set up camp and then have lunch. Upon reaching the edge of town we were stunned by this pretty little aire (Lat: 49.92347N / Long: 4.51705E). There were already some vans ensconced on the site but there was plenty of space. In ‘All the Aires North’ book by Vicarious Books it states there are 6 spaces – but clearly there is room for more. As I write this there are 8 of us and probably more to come if last night was anything to go by. 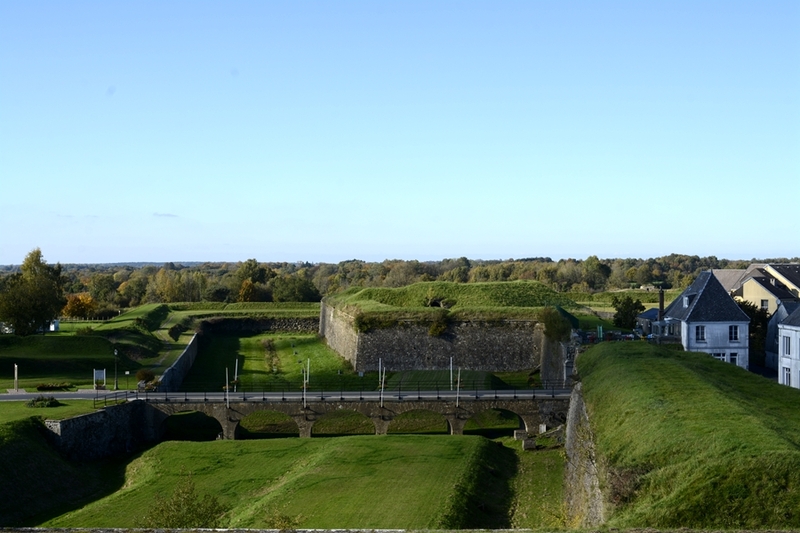 After lunch we decided to take a walk around the old town walls which in fact is a Star-Fort built by Henri II started in 1555 and gradually added too throughout the centuries. A fascinating walk, there are circuits for bikes around the outside and fitness exercise stations to work off all that Kugelhopf! This entry was posted in France- our first trip, Our 2nd year, Travels in Hilma and tagged Aire, Alsace, France, Hilma, Hilma the Hymer, Millery, Motorhoming, Olga Korbut, Rocroi, Star Fortress on October 14, 2017 by studio1901. Today we left the bikes behind and set off on our pieds. Boots laced up, rucksack full of food, drink and coats stuffed inside, off we set into some pretty moody looking skies hanging over the Vosges Mountains. 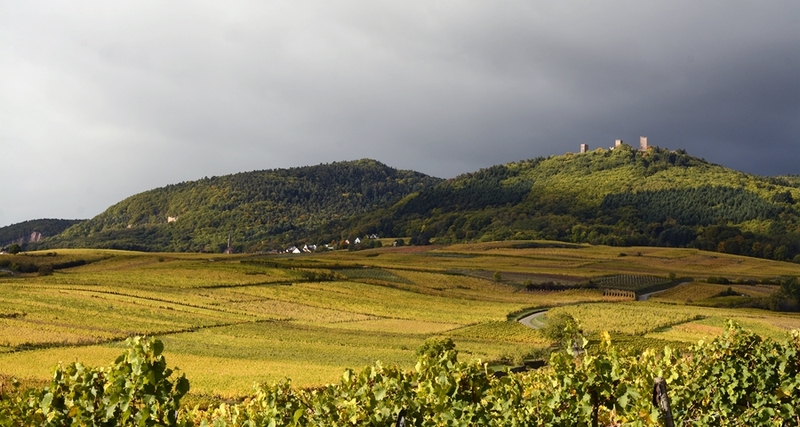 The Alsace is the second driest place in France according to most of the reports I have read. Today was no exception, despite the threatening looking skies we managed to stay dry all day. The walk was about 6 miles incorporating – yes you guessed, vineyards and pretty villages along with a smattering of woods. Beautiful, this is such a peaceful area despite the obvious tourism, once again I would say that I am sure it would be heaving at the height of the season. 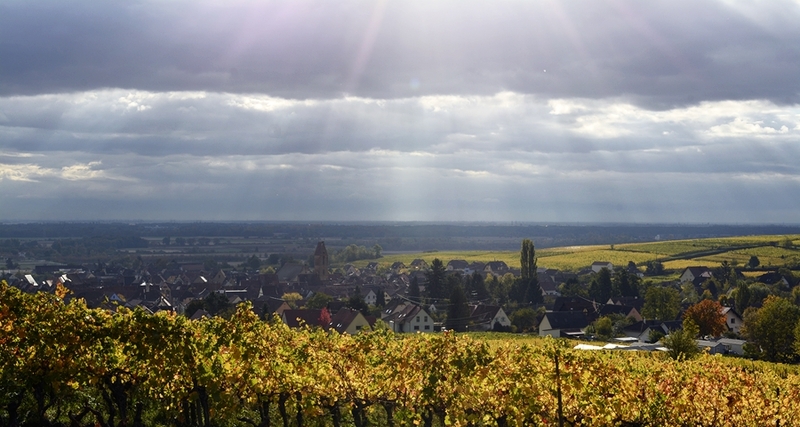 Following the map, my GPS and some obvious French signposting we wound our way up to the hillside, the view of the Rhine basin opening behind as we climbed, sunlight drifting across the land lighting up the vines with a golden glow. More moody skies – this time over over Les Trois Chateau. Yes they are vines all the way to the woods. This sleepy village has some wealth about it – plenty of fairly ‘newish’ properties with some magnificent views. 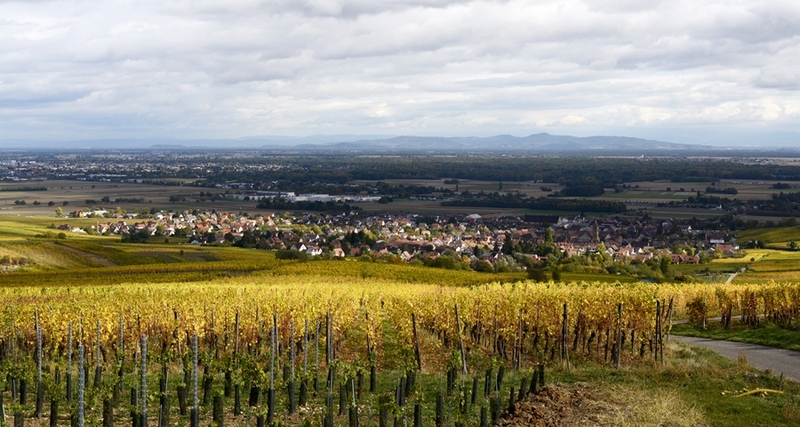 It is well within commuting distance of both Colmar and Strasbourg, also we are pretty sure that many of the vintners earn a decent living here. 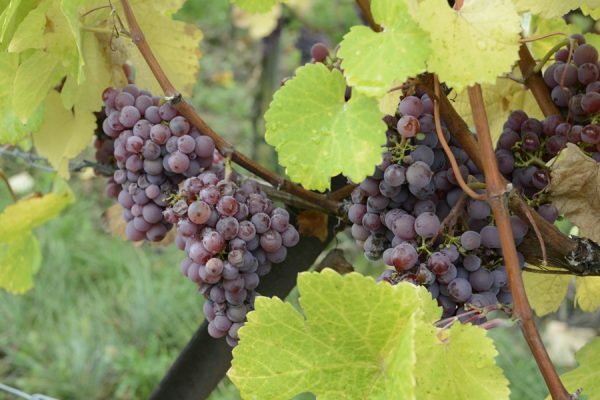 If our friends back in our village can grow grapes and get about 350 bottles a year, imagine what some of these boys and girls are producing – eye watering. 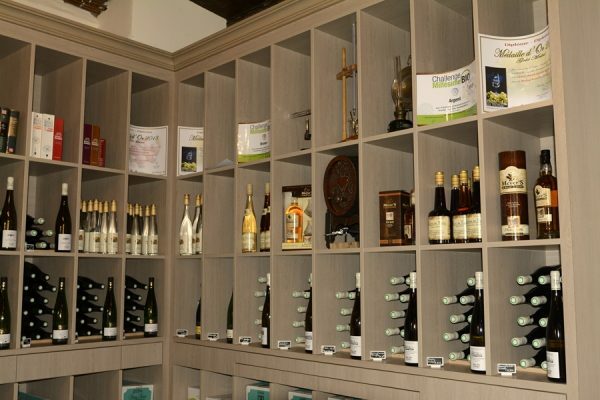 Prices for the Alsace wine bought direct from the producers range from £7 – £20 depending on quality, year of produce, etc. What struck us was just how clean it all is, villagers take great pride in their streets and their flowers, obviously vying for ‘best floral village’ and other such awards. A real pleasure to cycle and walk around, we would not hesitate to come back to this area again and spend more time here. We are off on our return journey tomorrow – we are taking 4 days to get back to the UK so again taking it as part of our holiday, not wanting to rush through this wonderful country. We have some Aires earmarked so let’s see what the next few days will bring. Goodbye Alsace! 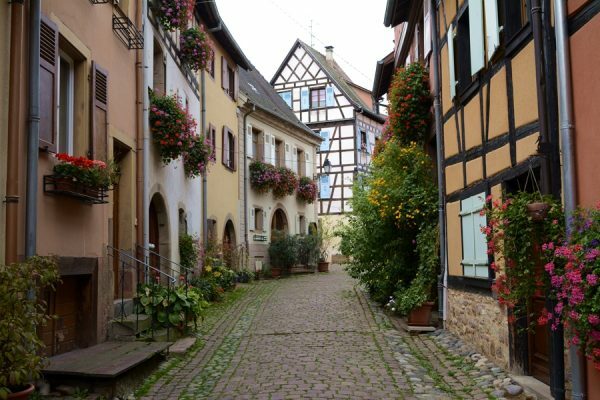 This entry was posted in France- our first trip, Our 2nd year, Travels in Hilma and tagged Alsace, Eguisheim, France, Hilma, Hilma the Hymer, Motorhome, wine on October 12, 2017 by studio1901. 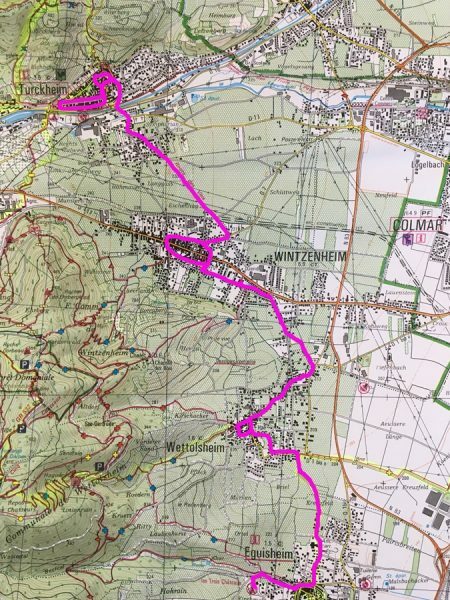 Today was our first cycle around the area – we had planned to cycle to Wettolsheim, walk around the market, buy some pain and vegetables and cycle back to Hilma. On arrival at Wettolsheim we came across a huge open air grotto – a memorial to the fallen in the great war, also something about children which we couldn’t quite make out. On entering the ‘centre ville’ we found the market today was one stall – some ropey old veg. A quick visit to the boulangerie for our staple bread and croissants and a change of plan was needed. Looking at the map we decided to move on to Turckheim (which I remember our neighbour saying was a great place to visit). Less than half an hour later, on lovely flat and uncrowded roads following the ‘Route des Vin’ signs, we found ourselves in another walled medieval town. This one much bigger than Eguisheim and not quite so ‘twee’, yes still catering for us tourists but had a much more lived in feel. Yet another beautiful border town street with a definite lilt to Germany. 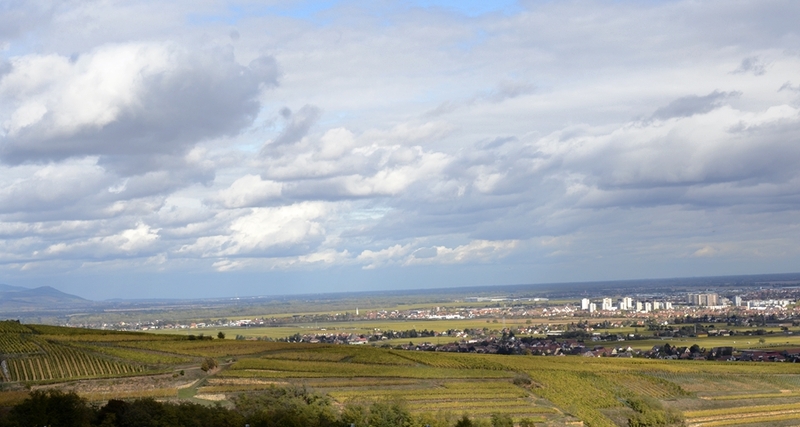 Note MORE vineyards in the background – they are everywhere! More pretty buildings, more pretty flowers, more cobbled narrow streets and a few café’s and restaurants (what’s not to like?). A coffee was needed before we set off to explore the town on our bikes which didn’t take too long. The cleanest public loos I have ever come across – anywhere! We decided to stop for lunch and had Tarte Flambee (thin pizza), a beer and Perrier, followed by another café before wobbling away again to find a supermarche to buy our veg. Just like at home in the UK it seems the small independent grocers are few and far between – I guess people rely more on the markets for their fresh produce. Is it me or are the French more respectful of cyclists? They seem to be much more patient than their British counterparts and also give us more space (maybe not in Paris though?). 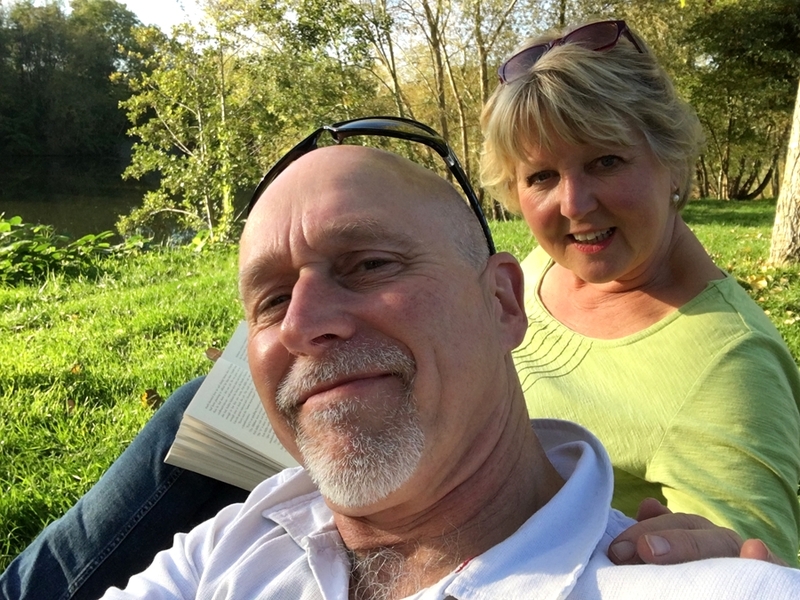 Finished off the day sat outside Hilma in the late sunshine, a glass of Reisling and a good book – later an end of day walk in the vineyards as the sun was setting – what a life – I want more of this! 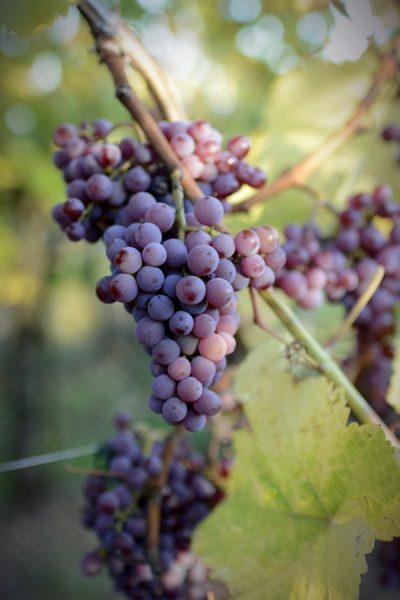 Couldn’t resist taking yet another photo of the grapes! 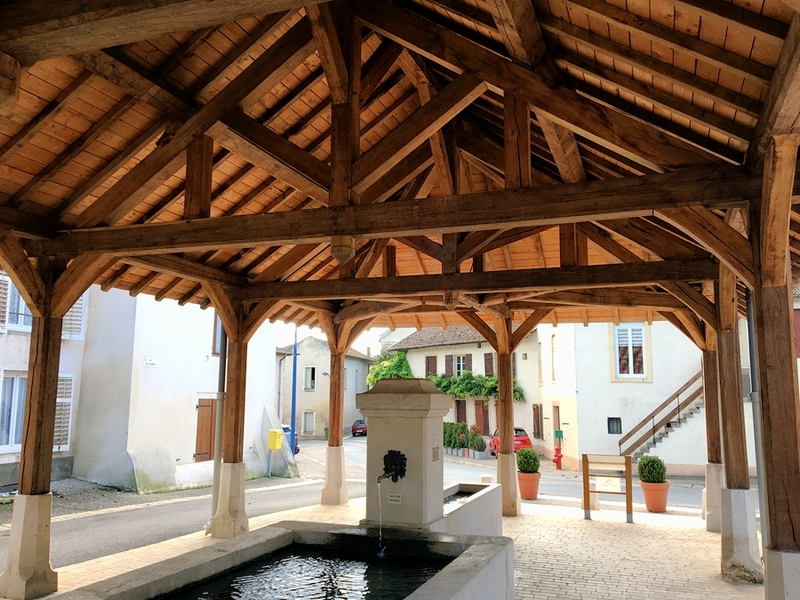 This entry was posted in France- our first trip, Our 2nd year, Travels in Hilma and tagged Alsace, Boulangerie, France, Hilma, Hilma the Hymer, Motorhome, reisling, Turckheim, Wettolsheim, wine on October 11, 2017 by studio1901. What a pretty little town – we did have a brief wander last night to get our bearings – stunningly pretty medieval town attempting to retain much of its original character (with some inevitable 21st century cheesiness). One cannot deny though how proud the Alsacians are of the history, much of which we were to find out. 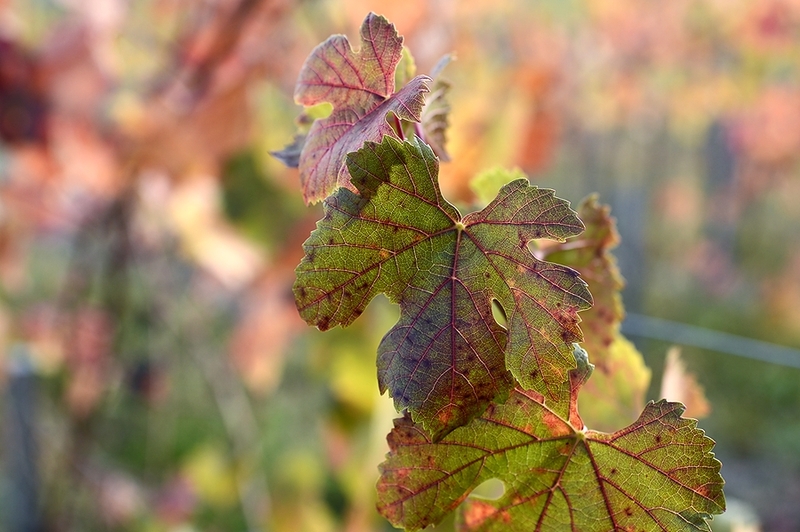 This morning we went on 1.5hr self directed vineyard tour around the immediate area, what a joy, we are here in the Autumn with all the vines turning yellow, pink or red creating some very pleasant views. It is incredible to think that there is 172km of these vineyards and we were in one tiny part of them. Finishing the walk in town we bought some quiche tarts and a Kugelhopf cake. Taste and texture like a Chelsea bun but BIGGER, we only bought a small one to see if we liked it – guess what? WE DID! So we will be buying a LARGE Kugelhopf for our travels home. Back into town late afternoon after digesting lunch and a few zzzzzz’s our next mission was to walk around the rampart sections of the town. These are not like castle ramparts but higher level streets making an elliptical shape surrounding the town. 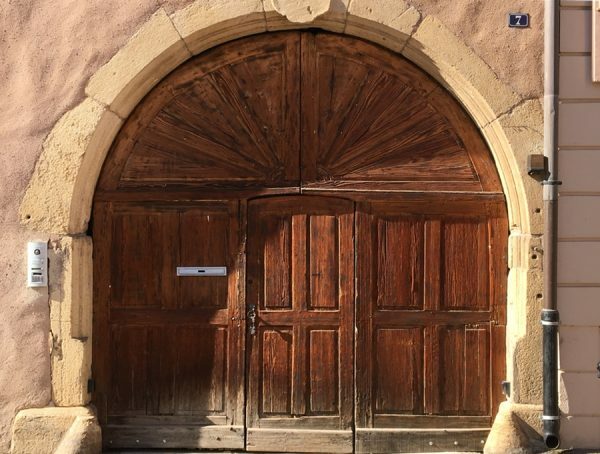 Originally there were two town entrances with people passing through two sets of gates each end (the first gate to collect your taxes before entering). A very interesting walk around with plenty of information points and pretty, pretty little dwellings. One can’t help thinking about what it must have been like to live their in the XV1th Century. 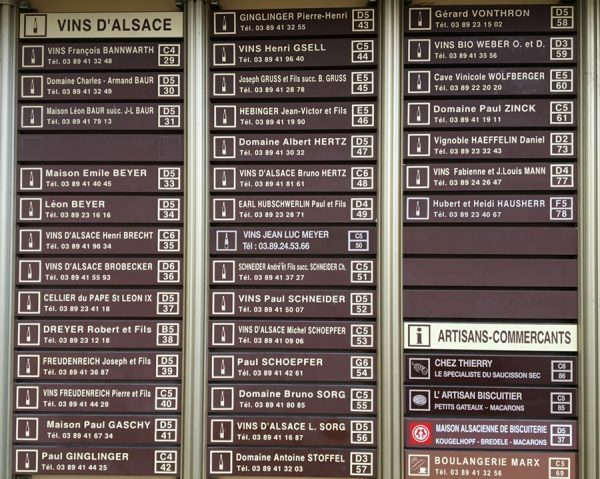 Next on our shopping list was some of the Alsace wine. It’s not a wine we were familiar with so we definitely needed some tastings – I had earmarked some producers from Hugh Johnson’s little wine book and went in search. Q: How many wine producers can you get in one town? Paul Ginglinger was our first stop – tasting several (hic) wines we chose 6 bottles of 3 different types and price range Reisling, Gewurztraminer and Pinot Gris Pfersigberg . On to the next one Bruno Sorg. Janette was feeling a little light headed by the time we had tasted some of Bruno’s vino – this time we went a little more up market and bought 4 bottles of Reisling Florimont – packed with flavour. 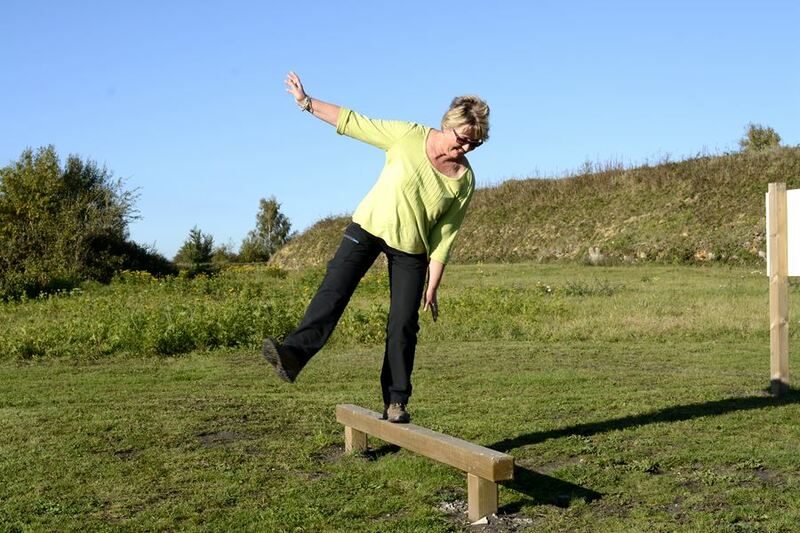 Carrying 10 bottles back to Hilma was hard work – now I’m going for a run – get rid of all those cake and wine calories. Tonight we will treat ourselves to a meal out so a prudent spending day needed tomorrow when we are planning to cycle to a local market. 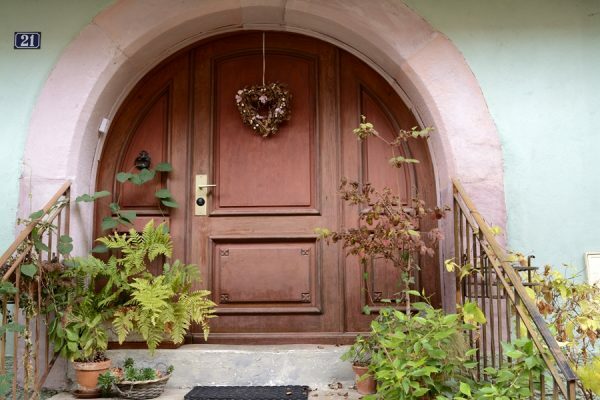 This entry was posted in France- our first trip, Our 2nd year, Travels in Hilma and tagged Alsace, Eguisheim, France, Gewurtztraminer, Grand-Cru, Kugelhopf, Les Trois Chateau, Pinot Gris Pfersigberg, reisling, vineyards, wine on October 11, 2017 by studio1901. Today was a shorter drive – a mere 120 miles to our intended destination. A small ‘deviation’ and then a stop to LeClerc for provisions (Leffe and bread – well maybe some veg and meat as well) with a lunch stop en-route all made for a pleasant journey. Whilst at the lunch we were glad we didn’t use the ‘frites’ van as the said owner take a pee behind his van – yuk! Driving in to the Vosges mountains the rain came down quite heavily, the road gradually rising to a fantastic viewpoint, Hilma did a grand job of climbing the mountains. I must admit to being a little concerned as once or twice when stopping I have smelt a hot clutch – pas de probleme. On arriving on the outskirts of Eguisheim Mrs. SatNav once again got us to the edge of town but wanted to take us through it’s very narrow streets, just in time we saw a sign for the campsite directing us around the outside. And a very pleasant little campsite she is. After the Aires though and our wild camping in Scotland it all does seem like they pack em in tight. Funny, although the drive was shorter today we both felt really tired. We put it down to the ‘newness’ of being in Hilma in a foreign land and having to concentrate that much harder about everything. Once we have this trip under our belt I’m sure we will settle into a pattern with future travels. At the moment, we can only compare it to the North Coast 500 trip – the daily mileages were less interspersed with 2 or even 3 day stops. 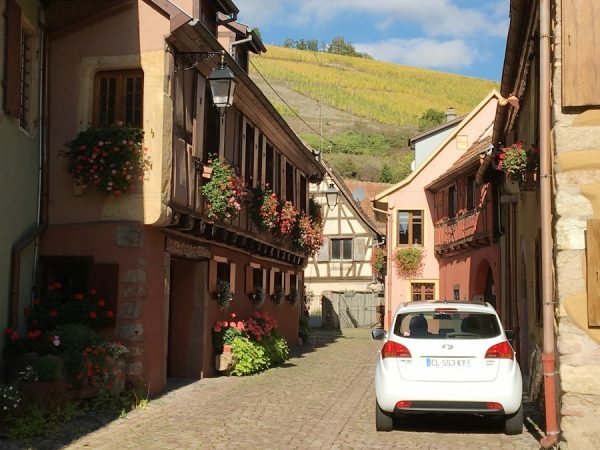 This entry was posted in France- our first trip, Our 2nd year, Travels in Hilma and tagged Alsace, Eguisheim, France, Hilma, Hilma the Hymer, Hymer, Motorhome on October 11, 2017 by studio1901. Before leaving our overnight stop we decided now that we no longer have Raggs we need to do some brisk walking (good cross-training to compliment my running). Walking down to the lake we found a mini entertainment complex rather like a smaller version of Center Parcs. 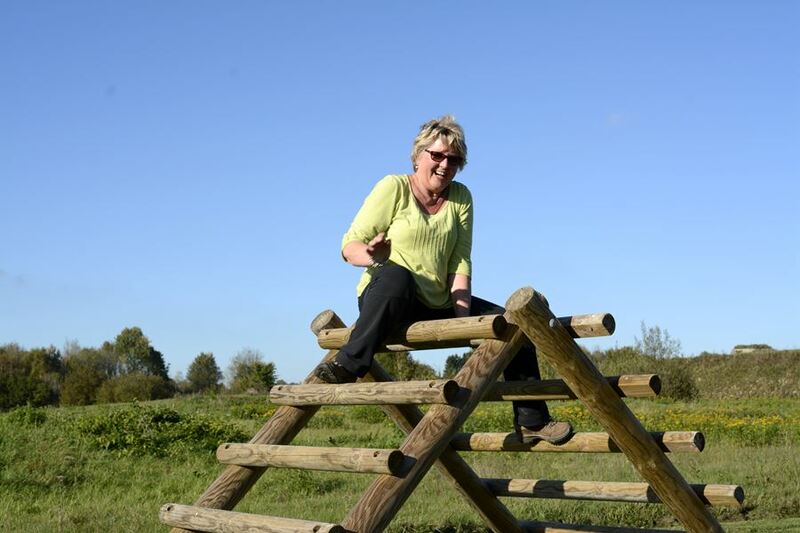 Lots of activities that could be done in the high season with plenty of cycle and walking routes to suit all. A great place to stop, maybe for a couple of nights and explore the surrounding paths. That said I would think at the height of the season space would be at a premium. Even at this time of year there were 17 motorhomes on the site (could easily fit 30). 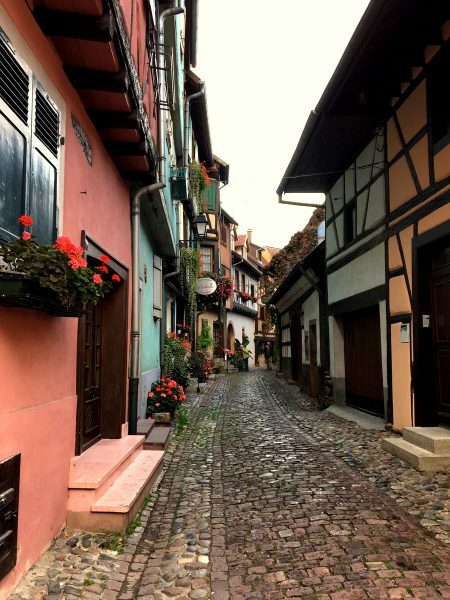 Because we were splitting the journey to the Alsace over 3 days we could choose our route without having to feel like chewed cardboard at the end of each day. The first part of today’s journey we had to negotiate our way through Verdun – Mrs. SatNav did a great job of getting us around the town, not sure we could have done it without her. Once out on the open road we revert to the Michelin regional maps at 1:200,000 (1cm = 2km) which I have to say (backed up by a road atlas) are good for getting an overview of the route whilst giving great detail. The problem with Mrs. SatNav is she wants to take us the most direct route which may not be where we want to go (or dare I say it, even suitable for Hilma’s girth). We aim for Lac du Madine (Lat: 48.93533N / Long: 5.71557) our 2nd overnight stop in France. Driving through some beautiful countryside with the maple trees turning a warm golden yellow also gave us a warm glow inside. The Aire is large, again near a lake which is an obvious magnet for holiday destinations. Although this site could easily take 50 vans there were only 5 vans spread around the site – all looks a little tired, beware the showers & toilets – better off in the van I reckon. Before supper went off for a 3 mile run near the lake on grass, through woods and good paths. Afterwards we both went for our constitutional walk with the bins, spotting a Great White Egret, hundreds of Mute Swans, Coots galore and the odd Gadwall. Slept like a log! 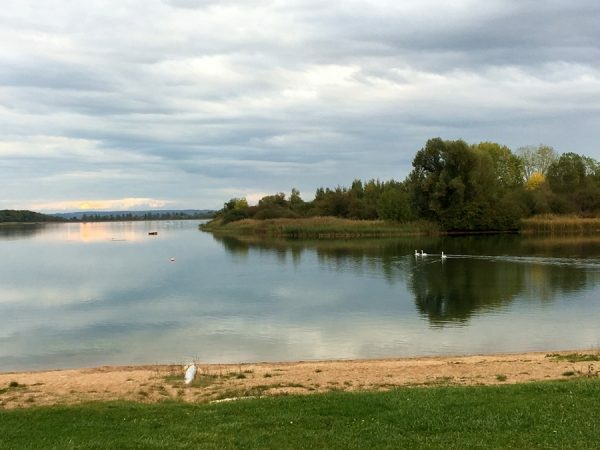 This entry was posted in France- our first trip, Our 2nd year, Travels in Hilma and tagged Alsace, Eppe-Sauvage, France, Heudicourt-sous-lesCotes, Hilma, Hilma the Hymer, Lac du Madine, Lac du Val Joly, Motorhome, motorhomes, Motorhoming, Verdun on October 10, 2017 by studio1901. Today was an early start – this was to be our first foray onto a ferry (sounds like a good soundbite – foray onto a ferry – I think I’ll copyright it and then the BBC can buy it off me for some exhorbitant fee and make some cheap ‘fly on the ferry’ documentary – or has that already been done?) with Hilma and to foreign lands not so far. 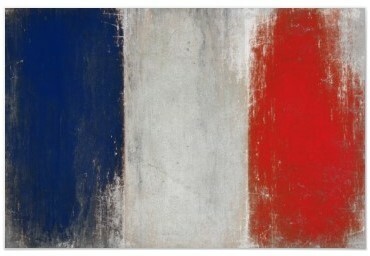 France was calling. 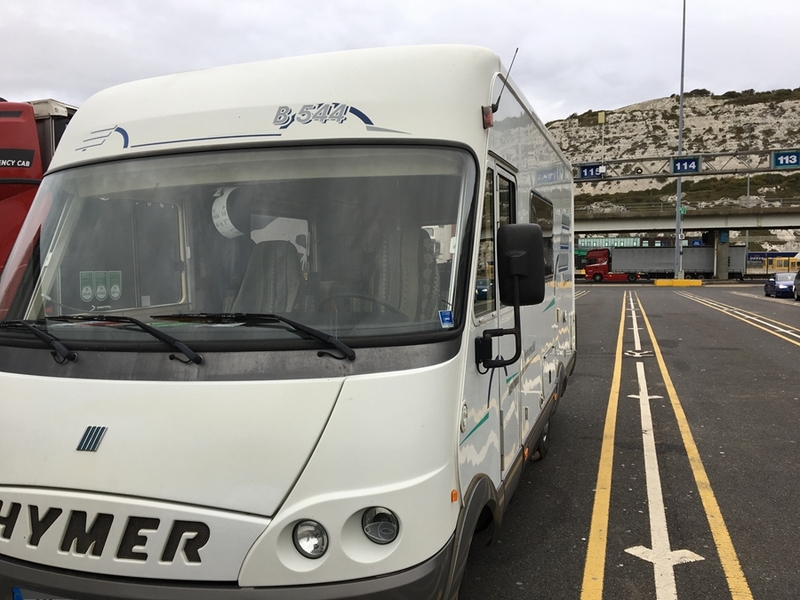 Hilma waiting patiently at Dover – note the Euro light stickers in the wrong place!! 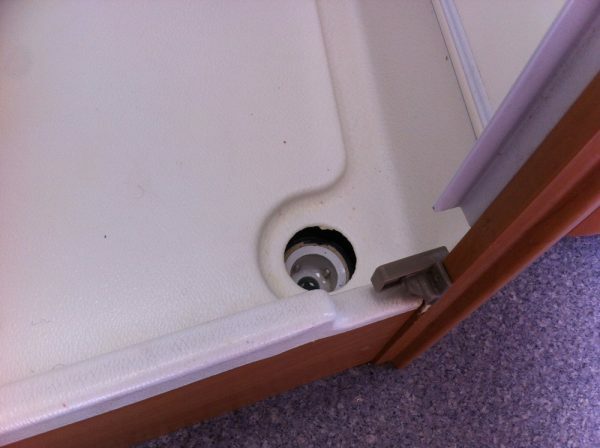 Nearly every motorhome blog one reads tells of how the French have got it sorted regarding motorhoming. 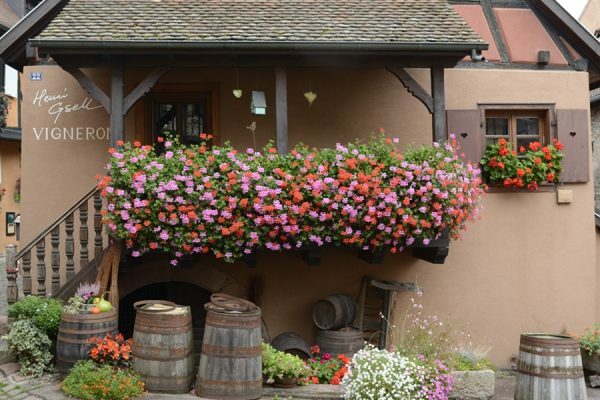 Last year we bought the ‘All the Aires France’ books by Vicarious Books so was able to plan 2 stops en-route to Eguisheim in the Alsace, our planned destination. There has been many a time we have previously driven through France (without a motorhome of course) and got caught out with driving times, ending up like chewed cardboard by the time we arrive. Not this time – we plan to travel a mere 140 miles to our first night stop at Eppe-Sauvage (Free) next to Lac du Val Joly (Lat: 50.11965N / Long: 4.13925E). No tolls for us, just motorways and D roads (still haven’t mastered the map roads to reality numbering yet). We hugged the Belgian border most of the way making good time and the aire proved just what was described on the tin. We have not tackled a ‘Fot Bleu’ (water, waste and electricity unit) yet and just looked at the machine wondering what the heck to do. As we are travelling we don’t need hook up yet and our batteries are getting topped up either whilst driving or by the 100w solar panel installed earlier in the year. Hardly used any water so no need to fill up yet. I’m hoping we can make it to Eguisheim without servicing Hilma with the necessaries! 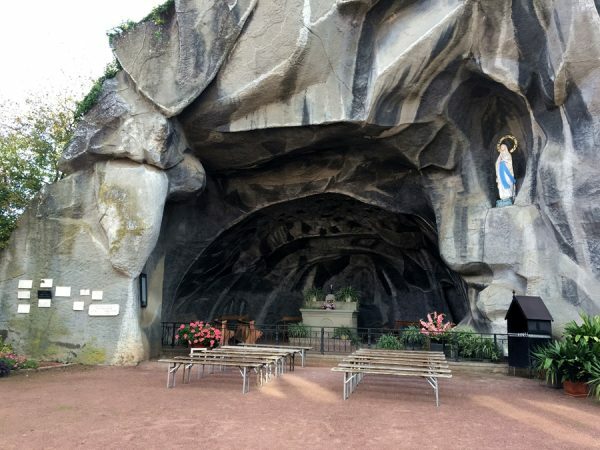 This entry was posted in France- our first trip, Our 2nd year, Travels in Hilma and tagged Aires, Alsace, B544, Eguisheim, Eppe-Sauvage, France, Hilma, Hilma the Hymer, Hymer, Motorhome, Motorhoming, Solar Panel on October 7, 2017 by studio1901. We are on our way to France. Now that is not such an earth shattering statement – but – it is our first ever trip abroad in Hilma! Excited and nervous after lots of planning, trying to dot all the i’s and cross all the t’s we are finally on our way. We initially tried to look at going through ‘le chunnel‘ but Hilma (close your ears now Hilma) is too big and heavy! Despite being a B544 she weighs in at a hefty 4 tonne gross weight (previous owners had it rated at this weight in order to carry a motorbike on the rear) and therefore she would have to travel with all those huge, commercial, smelly lorries. Well we weren’t having that! So ferry it is – 7 hours later we arrive just outside Dover for our trip tomorrow morning. And so we ended up at Black Horse Farm CC site, booked in advance, about 20 mins from Dover ferry port. 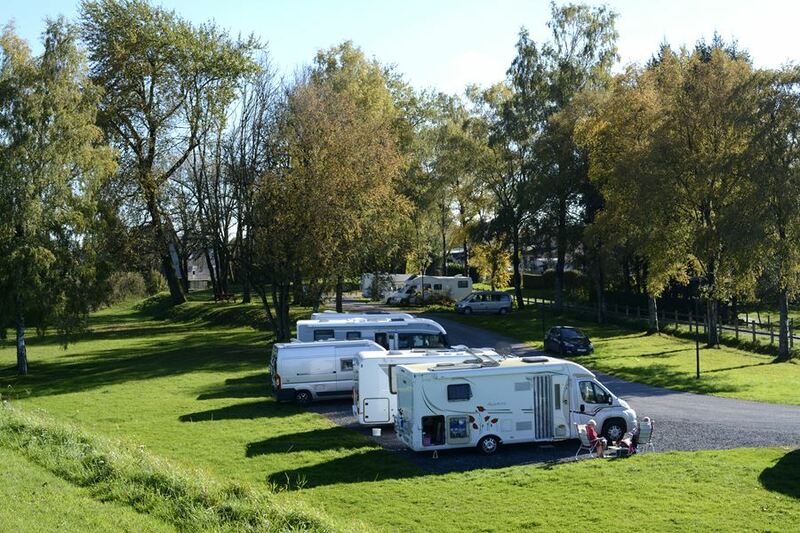 As this was our first time venturing abroad we wanted to make our first day or two as easy as possible – you know what you are going to get with a Caravan Club site. Off we tootle to the pub for an early meal (making it easy again) washed down with a pint of Cornwall’s Doom Bar ale. The fish & chips were magnificent at the Black Horse Inn 5 minutes from the site. On the way we met ‘Molly’ the border terrier, a smaller version of our sadly missed Raggs, making us think we need to get another one. We probably will, we just wanted some time in Hilma without having to worry about a four legged companion for a while. Let’s see how we get on in France first. Early start, early to bed and I’ll update this tomorrow. 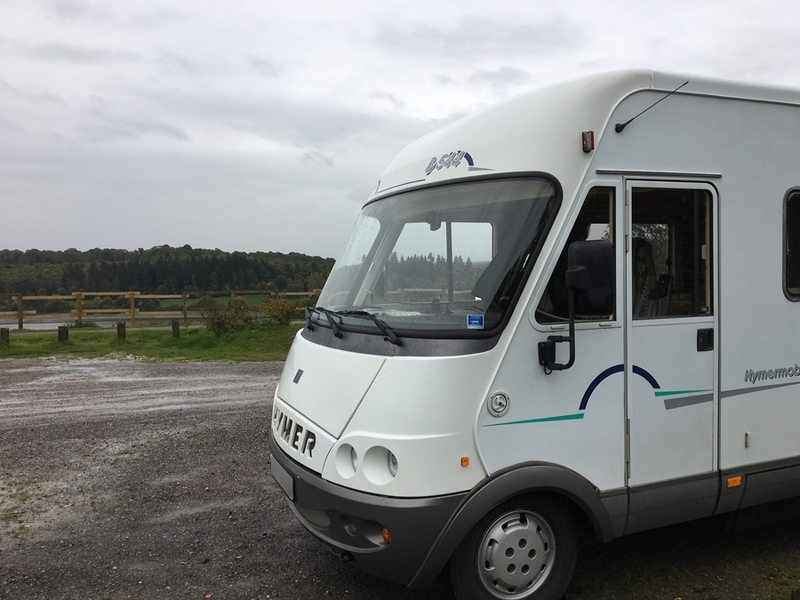 This entry was posted in France- our first trip, Our 2nd year, Travels in Hilma and tagged B544, Dover, Hilma, Hymer, Motorhome, travelling on October 6, 2017 by studio1901. The day before we were to set for the off for the long awaited wedding (and flower arranging fest) I collected Hilma from storage. Couldn’t quite put my finger on it but something didn’t ‘smell’ right. You know that feeling, you know something is going to go wrong, your just waiting for the little blighter to rear it’s ugly head and show you what. By the time I got her home I was pretty convinced that the time would be close and I would find out. Sure enough the next day when packing the smell was there again, I knew the smell – battery acid. ‘Don’t panic Mr Mannering, don’t panic’ (for those of us over 50 you’ll know what all that is about). My highly tuned earholes by now knew every sound that Hilma threw at me, I could hear something faintly bubbling, putting 2 and 2 together (I usually get 5) along with the battery acid smell I had narrowed it down to – yes you guessed it the leisure battery. Later the next day Janette mentioned she had heard an alarm going off – now I don’t know if that was the built in alarm on the battery panel or our CO2 alarm. 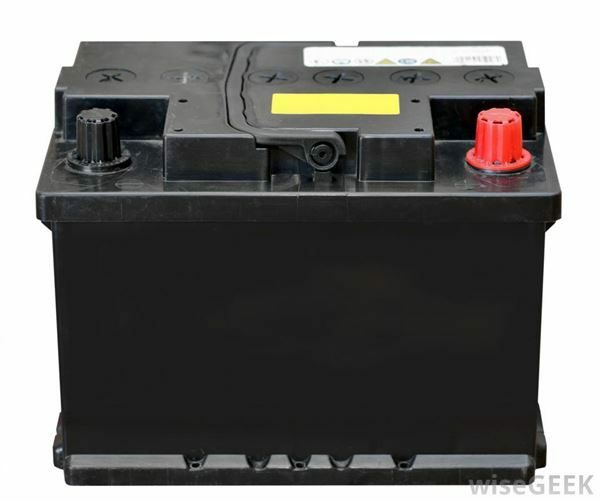 So we are 1 day off going to (the long awaited) wedding and flower arranging fest, not an awful lot of time to get this sorted, yes OK easy enough to find a battery but I had no idea how to get at them (one battery under each front seat). I remembered an ‘Our Tour‘ post where Jay had some battery problem and saw that the whole seat had to come out! Not being an electrician and rapidly running out of time I did not have time to track down ‘why?’ – just needed to sort it quickly. The plan was to order a new battery and collect it first thing in the morning before zooming off too (the long awaited wedding) – Janette would be going ahead to start on the church flowers with me (support crew, sweeper upper of leaves and general flower arranging debris picker upper) following on in Hilma. Battery ordered, now tackle the passenger seat and get the battery out – duly armed with spanners I removed all the bolts I thought and voila – my god it was heavy. 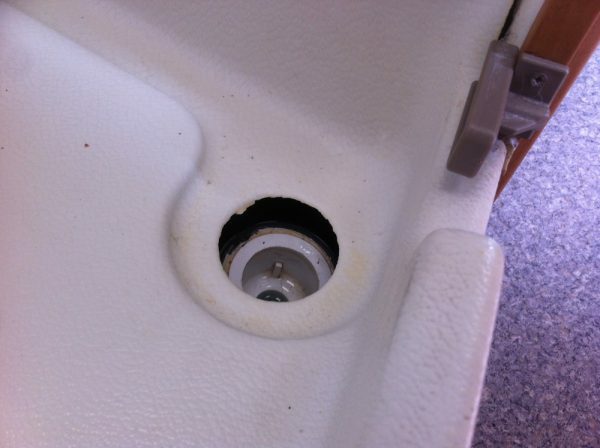 I made sure I had disconnected the solar panel fuse, there was also a huge 50 amp fuse next to the battery – so I thought it prudent to remove that as well. Job done, smelly noisy battery removed. Of course having bought it second hand we had no idea how old these batteries were – they looked good but who knows. Next day, collected new battery and also ordered another one (105 Ah) so that when we returned I could fit another one that would both be of the same age. Battery fitted, seat replaced (yes, still blooming heavy) – all packed up, ready to roll with a smug smile on my face, off I tootle to the CL site which was 200yds from the church where wonderwoman florist Janette would be making the tiny church (90 seats max) into what would look like a miniature Chelsea Flower Show. My afternoon spent sweeping, watering, misting and generally doing flowery type things that I didn’t have a clue about getting the church ready for ……….. the wedding. This entry was posted in Bits & bobs, Our 2nd year and tagged battery, Solar Panel on September 6, 2017 by studio1901. We arrived back from our NC500 trip with barely a glitch whilst we were away, apart from a blown fuse which we managed to sort within a few minutes. Already we were talking about where to go next, a few weekends in the UK, some catching up with family and then off to France later in the year for our first foray abroad. Easy, peasy. We were literally on the last bit of cleaning and ‘plop’ (and a scream from Janette) one of the plug holes in the shower tray literally broke away all the way round. We were not happy bunnies, when things like this happen the brain goes numb and you wonder how the heck a) it can happen and b) how the heck are we going to get it fixed. The break was all the way round and on closer inspection it seemed pretty clean, apart from one small jagged bit. Time to start fiddling around and see what’s what underneath. Easier said than done – a german built motorhome is a thing of beauty – it is also very well put together and a devil to take apart. I tried taking the front lower cover yet despite undoing the holding screws it seemed to be locked in place by the shower tray itself. It was then that the enormity of the possible task ahead of removing the whole shower tray was beginning to dawn on me. I managed to remove all the shelving in the cupboard next to the shower to see the pipe run and check there was no other leakage occurring, fortunately it was dry as far as I could see. 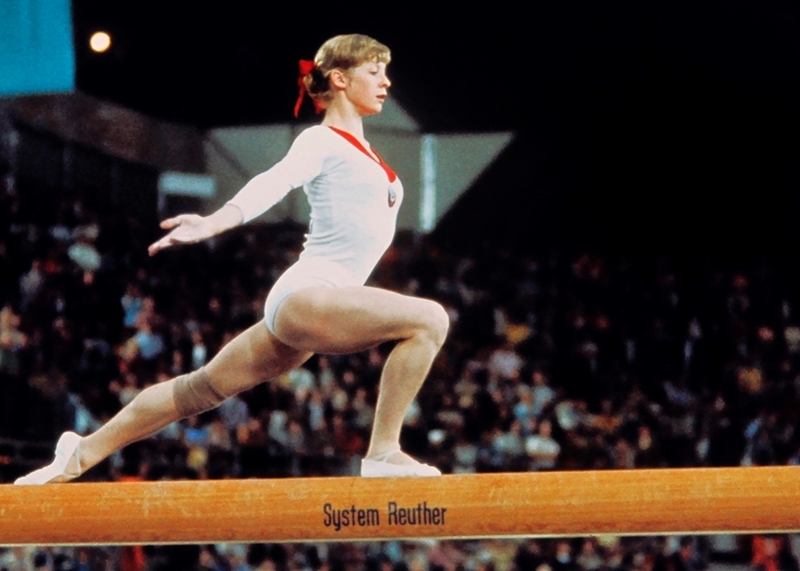 The break point seemed very thin, perhaps about 1mm – the probable cause was just age (but don’t tell Hilma), uv deterioration and and perhaps many years of using bleach like substances for cleaning. Daunted by the whole thing I decided it was time to accept fate and ring Brownhills of Nottingham to get a price for a new shower tray. Fortunately I was sitting down – £498 plus delivery and there were 7 in Germany and could be with us in 14 days. 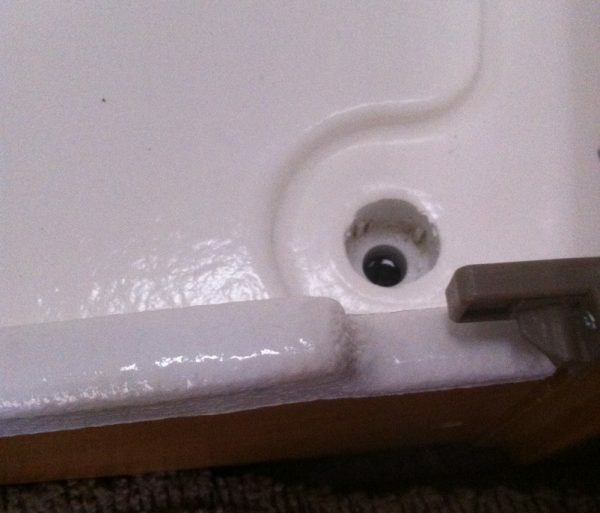 Now it wasn’t necessarily just the shower tray price that I was worried about, it was how much someone would charge to fit it if I failed miserably (which was quite a high probability). Quick calculation in my head was starting to get close to the £900 – £1,000 mark (ouch). 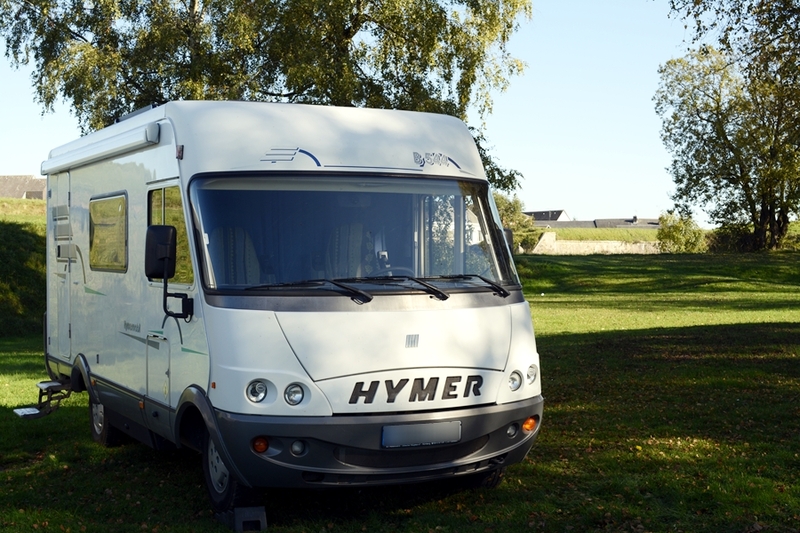 Whilst talking to the nice man at Brownhills I found out that every Hymer has a unique ‘build code’ and once you have that trying to source parts is so much easier. Brownhills man (as opposed to Piltdown man) was very helpful and sympathetic, he mentioned a possible repair service but, didn’t know where they were based but remembered they were called ‘Speedcoat‘. Nothing to lose then, a quick search on Google revealed a company called Speedcoateuro, logging on to their site they were easily within driving distance so I gave them a quick call, sounded positive , said they could probably fix it but if I could e-mail some photo’s that would help. The reply back was in the positive, I asked for a quote (holding my breath) – £360. I must admit at that point I wanted to get Hilma over there straight away but we had to wait a few days. I was still wondering if this could be done or not. Anyway off I popped with Hilma the following week, turned up, Dave had a quick look and said “Yep, no problem – should be done today, but just in case allow for an extra day”. Dave talked me through what they were going to do – ‘hot stitch’ the 2 pieces together and then spray a flexible 2mm coating all over the tray base. 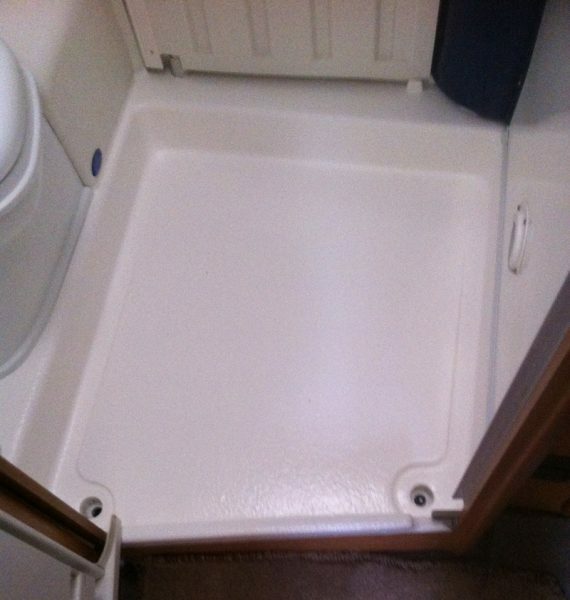 Nothing would need to be removed, they would ‘build’ a plastic tunnel sealing the rest of the shower and extending out to the door which conveniently was opposite the shower which would then seal off the rest of Hilma. All sounded good, proof of the pudding would be on collection. I rang later that day and was informed it was ready for collection at 5:00pm (sigh of relief). Fantastic job – looks the business – all we needed to do was wait 24hrs before trying out the shower. It came with a lifetime guarantee (lots of clauses obviously) but I was happy to see the tray all back together in one piece without having to attempt a complete re-fit of a new one. In my eyes these guys saved me a whole heap of trouble and money. This entry was posted in Bits & bobs, Our 2nd year and tagged Shower tray, Shower tray repairs, Speedcoateuro on July 3, 2017 by studio1901.